Late 17th-century French calf with tooled back in green morocco case lettered: Treatise on Chess, Backgammon, etc. French Ms. on vellum - saec. XIV. Owned in the 17th century by De Vaubouton (signature on fol. 146v); Sir Andrew Fountaine (1676-1753) of Narford Hall, Norfolk; his sale (London, 1902, no. 202) to Quaritch; Richard Bennett, Catalogue of manuscripts and early printed books from the libraries of William Morris, Richard Bennett, Bertram, fourth Earl of Ashburnham, and other sources, no. 110; purchased by J. Pierpont Morgan (1837-1913) with the Bennett Collection in 1902; J.P. Morgan (1867-1943). 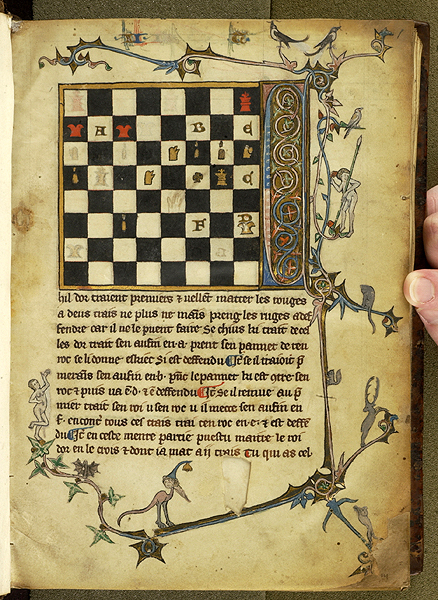 Ms. book of chess problems; written and illuminated in northeastern France, perhaps ca. 1300. Decoration: upper half of each page has a representation of a chess board or other game board with pieces in position to illustrate the problem described in the text below; some pages with decorative borders containing grotesques.